Georgia Tech may have lost 20-17 in overtime to Virginia Tech, but its fans may have gotten the last laugh in the battle of nerdy Tech traditions. S adium sign outside of the box office, police told the Roanoke News. Stealing the "T" is a longstanding Georgia Tech tradition. Georgia Tech students have been stealing the "T" from the Tech Tower on their campus since the 1960s. Since then, the prank has expanded to stealing "T's" wherever they can. 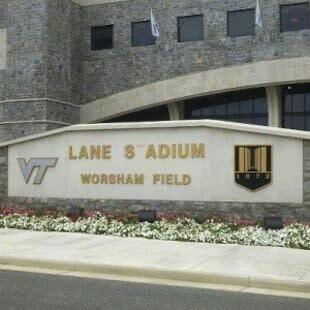 While the police say they have no leads on who might have stolen the "T," a Facebook group called "Only at [Georgia] Tech" posted a photo Monday afternoon of the sign and its missing "T." It added the caption: "Lane S adium. Only a ech." "Y'all may have left with the T but you certainly didn't leave with a W."